Each summer since 1982, the CAU has been inviting Visiting Professors from Canada. Prof. Boschman will be teaching two classes this coming summer. From the early seventeenth century to now, "wilderness" has captivated the American psyche and been projected on to landscapes from Alaska to Florida through various forms of textual and cultural discourse. This course includes literary and critical texts from Anne Bradstreet's Puritan depiction of Nature in "Contemplations" to Cormac McCarthy's post-apocalyptic novel The Road. Course readings will be diverse, including but not limited to poetry, fiction, drama, journalism, correspondence, diaries, film, still images, and popular non-fiction accounts, but always with a focus on how Old World ideas and ideals regarding the "natural" affected, impacted, and shaped the so-called New World in ways that linger today. Discovering how the Columbian Exchange continues to impact Turtle Island will also mean taking into account Indigenous texts. Please purchase the following book: McCarthy, Cormac. 2006. The Road. All other texts will be made available on OLAT. Please be advised that the course can at times be graphic and harrowing. Recent cultural production provides intense opportunities for examining where we humans are environmentally—and where we might find ourselves in the near future. Under the rubric of extraction and consumption, and in the context of the Environmental Humanities, this course will involve focused analyses of text and media, including the graphic novel, the still image, short and feature films, websites, and critical theory. Topics include climate change in the age of Trump; sacred and toxic spaces; uranium extraction and its different legacies; the environmental vampire; and meat as a vector for despoliation and disease. Don't worry, we will look for signs of hope, particularly in the company of trees! And especially now, the Environmental Humanities may provide the space for generating new scholarship for the years ahead. Prof. Dr. Domenico A. Beneventi is professor at the Département des lettres et communications at Sherbrooke University, Québec and will be our visiting professor during the summer term 2017. 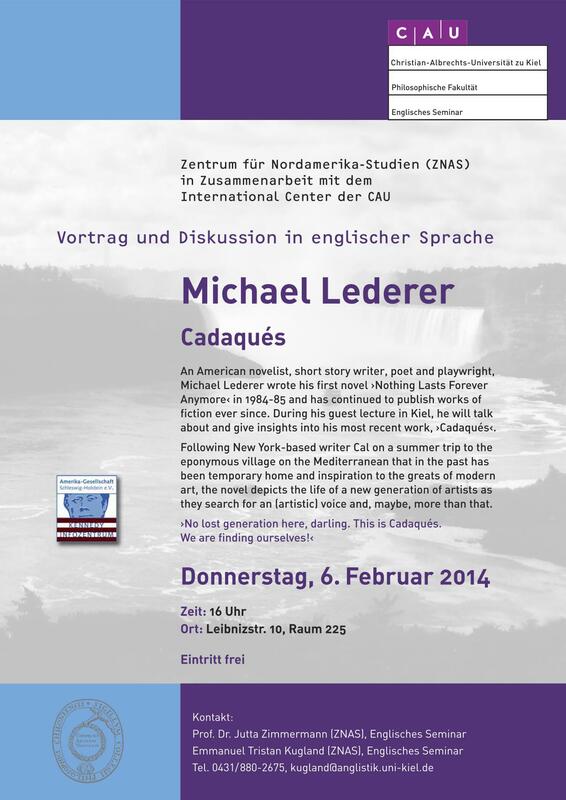 He will teach two Master seminars on Anglophone Québec-Literature and on Urban writing in Canada. You can find the course descriptions in the NEWS section. 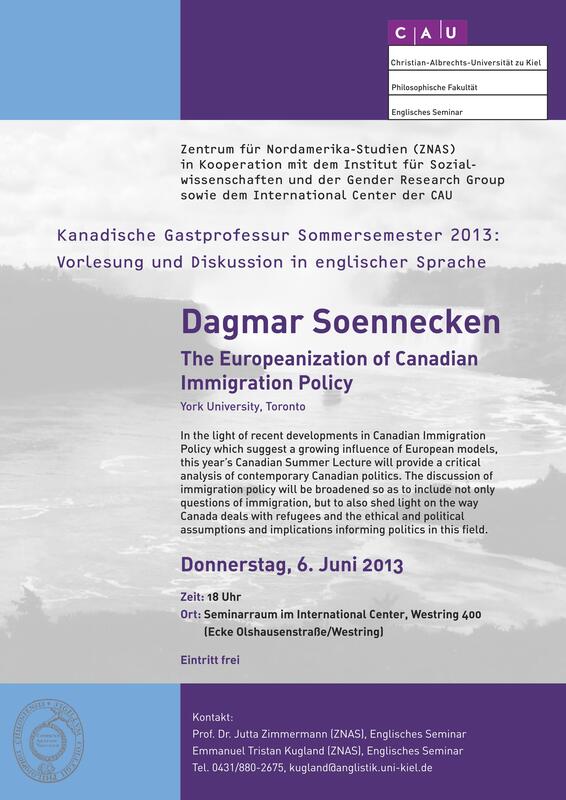 Prof. Soennecken teaches Political Sciences at York University, Toronto. She holds a B.A. in Legal Studies from Carleton University and an M.A. in Political Sciences and Women Studies from the University of Toronto where she also obtained her Ph.D. in Political Sciences. Since 2009, she has been teaching at the School of Public Policy & Administration and at the Department of Social Science. At Kiel University, she will be teaching classes in the M.A. Program 'Migration and Diversity' as well as at the Department of Political Sciences. 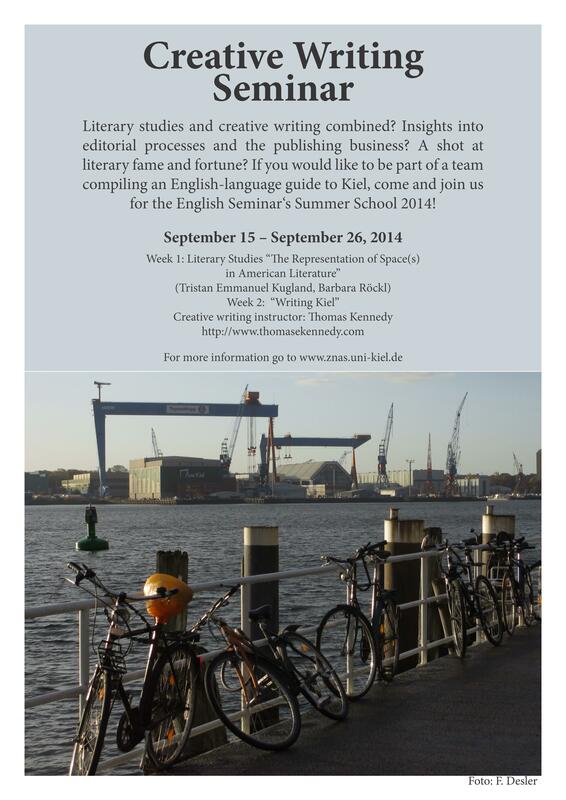 For a list of the classes taught by Prof. Soennecken in the summer term of 2013, click here. In addition to her regular classes, Prof. Soennecken will also deliver a guest lecture organised by the Gender Research Group and the Center for North American Studies (ZNAS). Her lecture will be entitled "The Europeanization of Canadian immigration policy" and will be open to the general public (details tba). For more information and a list of publications, click here for Prof. Soennecken's page at Vork University. In the summer of 2012, Prof. Dr. Stefan Dollinger held the Canadian Guest Professorship at Kiel University. Assistant Professor of English Language at Vancouver's University of British Columbia (UBC), Prof. Dollinger taught two classes on Canadian English and gave a guest lecture discussing the assumption that Canadian English is a conservative variant of English. Prof. Dollinger obtained his Ph.D. at the University of Vienna and has been Assistant Professor of English Language at UBC since 2009. He is currently co-editor of the second edition of the Dictionary of Canadianisms on Historical Principles (DCHP). For more information, click here for Prof. Dollinger's page at UBC. In the summer term of 2011, Prof. Dr. Richard Cavell held the Canadian Guest Professorship at the University of Kiel. Professor of English at the University of British Columbia in Vancouver, Prof. Cavell taught a class on the work of Douglas Coupland as well as a class on Cultural Memory in Canada. 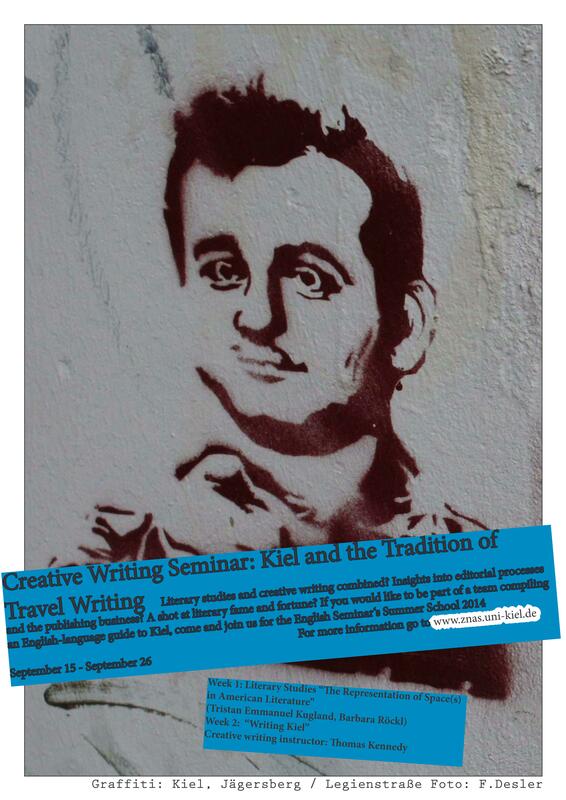 He also gave a guest lecture entitled 'McLuhan in the Global Village'. Click here for Prof. Cavell's page at UBC (includes CV and list of publications). Prof. Harding held the Canadian Guest Professorship twice, in 2008 and 2010. Professor emeritus of the University of Saskatchewan, he taught classes on Canadian Identity and the North in Canadian Literature (2010) as well as indigenous literature in Canada. Professor of Linguistics at the University of Toronto, Jack Chambers held the Canadian Guest Professorship at Kiel University in the summer of 2007. The author of numerous publications on Canadian English, Prof. Chambers is also an esteemed Jazz Critic and the author of an award-winning biography of Miles Davis. Click here for Prof. Chambers' page at the University of Toronto (includes CV and list of publications).